Walk across the Olympic National Park in Washington State. We started the hike near Hurricane Ridge at the north of the Park. Then we followed trails and even off trail to the south at Lake Quinault. 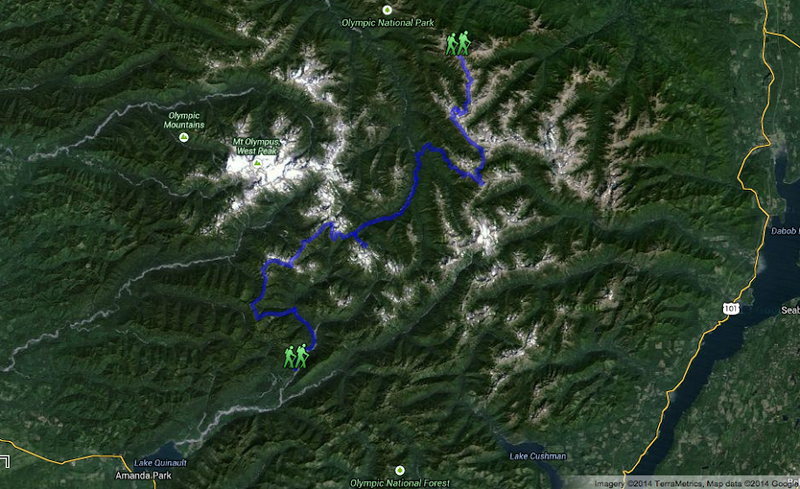 This is a custom route that I put together from years of walking in the mountains. 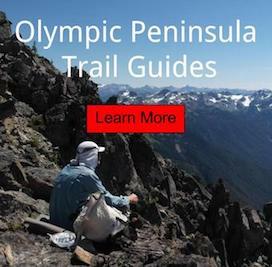 Our path would include 2 days of off trail travel, intersect the Pacific Northwest Trail for a full day, sleeping on the shoulder of the Bailey Range and then continuing southbound on a high ridge into the Quinault Rainforest. This route would lead us into some beautiful country. Each campsite was hand picked from the years wandering the mountains. I do not want to include the names of these places, for the sake of the impact the internet has on remote wilderness. Some of these points of interest have a trail to them and some do not. I will leave that up to your imaginations. Editor's Warning: Detailed map reading, route finding and compass required. Several of the days include a traverse that require basic mountaineering skills. It is not suggested for a hiker that does not feel comfortable with exposure (cliffs) or leaving a maintained trail. We slept at a glacier that has receded to the point of melting. Then a few days later, we got to see them still alive and doing well. We timed our trip to be during a time of year, where there was minimal snowpack. Although we did not see any Olympic Elk, several Black Bear were viewed grazing on wild berries near our camp. We competed with any bear in the area for the amount of berries we ate on this trip. One of the nights, an hour was spent observing Olympic Marmot near another camp as well. The Olympic Mountains hold a special place in my heart, it gives me a good feeling to share the area with others. This time I would be accompanied by my lovely girlfriend. She was the perfect addition to the trip. Sure is a big change of pace from sleeping alone; like what I'm acclimated to. It was also nice to be able to split up the weight of our backpacking gear. Food was also divided between us. I would carry weight dense calories and she would have bulky items inside her backpack. That way to minimize the impact on our bodies for such an adventure. Lots of junk food was consumed. It was amazingly helpful to practice packing our overnight camping gear into our backpacks, before leaving for this adventure. The weight and space of that much food is a real challenge. Especially, when most of the areas we hiked into required you to store food in a bear canister.